This page details steps to install Michael Greenhill's blue-liveried Countrylink XPT train (b_xpt11.zip, 978kb, 29-Sep-02 from the Train-Sim.com library). Note: Read through Class 43 HST / XPT cab & sounds aliasing for some help on where to install the cabview and sound files and refer to the XPT tune up page to see how to alias the Class 43 HST cabview and sounds in the ENGine files. To be consistent with the way MSTS likes things, we'll be making some changes to folder names and file names. As well, since one of the XPT power cars supplies head-end power, we'll need two power cars for realism, one of which has lower power available. We'll take advantage of the updated ENGine file parameters worked out for Chris Jennings' candy-liveried XPT. As well, we'll be using James Hunt's HST cabview brcl43.zip (4.5Mb, 24-Jan-02) and the HST sound set cl43sfx.zip (4.2Mb, 14-Feb-02), the latter giving us a real feel for driving the XPT. Open b_xpt11.zip in a minimised WinZip window and open Windows Explorer in a maximised window. Navigate your way to the ...\Trainset\ folder and create a new subfolder named XPTBlue. Drag and drop these files into the XPTBlue folder. delete xptblue.eng in the XPTBlue folder. copy xpt.eng and xpthep.eng to the XPTBlue folder. This saves us having to re-enter all the horsepower, mass, friction, cab aliasing and sound aliasing values. What we must do, however, is edit both ENGine files to give MSTS the correct Wagon, WagonShape and Engine names otherwise it will get upset. That's it! 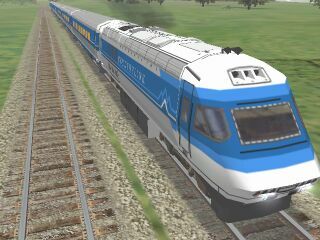 Use ConBuilder to create a typical XPT 7-car consist and you can start enjoying the speed and sounds of driving a Countrylink XPT at the speed it was built to travel at. If you haven't got Chris Jennings' candy-liveried XPT installed, you'll need to do some extra work to achieve prototypical behaviour. open both ENGine files in separate instances of WordPad and alter the parameters for horsepower, mass, friction and so on from the XPT engine tune-up page. starting back at the top of each ENGine file, work your way through to edit the changes above for the Wagon, WagonShape and Engine names. 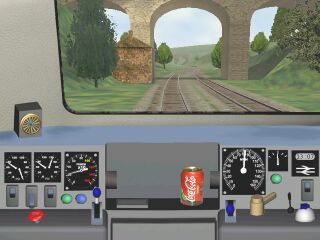 starting back at the top again of each ENGine file, change the Sound and Cabview parameters for a realistic cabview and stirring HST sounds. make the change to the coupling type in xptblueecon.wag, as above. use ConBuilder to make a 7-car consist. In the cab of a Countrylink blue-liveried XPT at two-thirds of its real maximum speed (but not allowed in Australia). For a comprehensive history of the XPT, see David Bromage's XPT site.